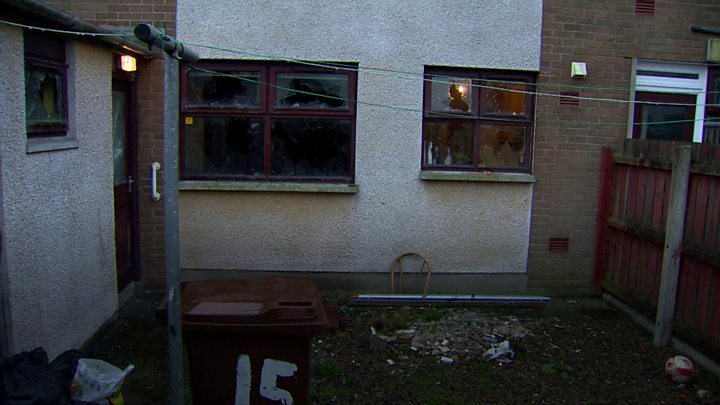 The carnage in a house where five men were attacked by a gang with baseball bats was like a scene from the Troubles, a woman has said. A gang forced their way into the house at Hollybank Drive, Newtownabbey, at about 20:20 GMT on Sunday and beat the occupants, who are Romanian. The woman who went to their aid said there was blood and glass everywhere. She said she saw teenage boys who were very frightened and a man was bleeding on the floor with severe head injuries. Police are investigating the attack as a hate crime. One man was taken to hospital. "When I went in, every window was smashed, the house was wrecked. The bathroom and toilet had been kicked in, there was blood everywhere, glass everywhere and wee teenage boys were upstairs in the back room, really really frightened," the woman, who does not wish to be named, said. "In the main bedroom, a man aged 28 or 29 was lying on the floor with severe head injuries. He had been beaten with a baseball bat on his leg and it looked like it was broken. "He had a dislocated or broken shoulder. It looked like a bullet or stab wound to his shoulder. His head was bleeding very badly. He was crying and really in shock." The scene was horrific, she said. "It was unbelievable. The last time I remember seeing something like that was during the Troubles. "It was really, really frightening for all the neighbours and the elderly. It was a horrific scene, not something I ever want to see again." "People are shocked and disgusted at the thought of somebody being really badly injured." SDLP councillor Noreen McClelland said it was a vicious attack. "Under no uncertain terms can such a brutal attack be justified," she said. "There is no place for violence in our society and those who are responsible for this assault must face the full force of the law. "